At The Candy Buffet Company, we are the world leaders in creating, styling and managing the perfect lolly buffet. We cater for all different styles of corporate event. Over the past 6 years, we have been able to reach uncharted heights, and surpass all benchmarks in dessert catering. The corporate market is looking for more diverse and interesting ways to develop and style desserts and all things sweet. That is where we really have our time to shine. We are able to work with our corporate clients to assess their needs, follow their direction on theming, styling and also working with the venues existing features to create something not only truly unique, but also very fitting with its surroundings. We want to make the entire process of working with us seamless! Our lolly buffets surpass the standards of your corporate event suppliers. When you are looking for Corporate Ideas for your next function, look no further then a candy buffet to suitably impress your guests. We can work with any type of theme. As the organiser, you are no doubt always on the hunt for new corporate event ideas. Well hunt no further, because nothing impresses guests and the paparazzi like a candy buffet. The Candy Buffet Company has helped event organisers bring their corporate event ideas to life, allowing guests to help themselves to a box of candy while they enjoy the evening. Candy buffets can be elegant and sophisticated to suit a fashion show, or childlike to suit the younger-set. Whatever your corporate event theme ideas maybe, The Candy Buffet Company can create a lolly buffet to match. Making your corporate event the highlight of the social calendar requires something special and unique. A candy buffet is the perfect opportunity to thrill your guests. It combines the latest in design with the decadent child-like fantasy of a seemingly endless supply of treats. The Candy Buffet Company is a renowned national company catering to the corporate event market in its delivery of captivating candy centrepieces that have been known to cause all manner of fuss. Without exception, a lolly buffet is a punctuation mark on your event that people will continue to enjoy for years to come. Custom lolly creations with your corporate branding will also add to your event! 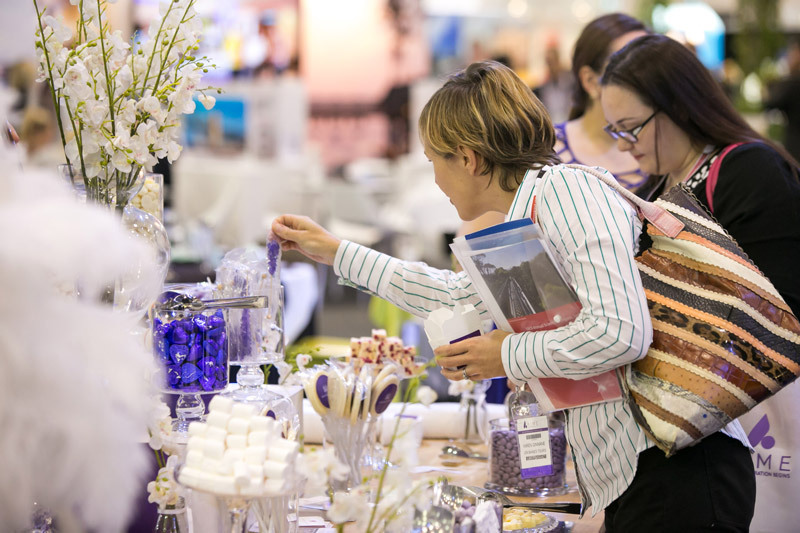 Adelaide lolly buffet – Corporate Lolly Buffet for Expo Booth – Attendees Love it! • A national, scalable service to match your requirements. • $20,000,000 public liability insurance. • Professional design consultation and theming – our candy buffet designers are the envy of the industry. • Seamless integration with your catering company. • Superior selection of treats for your candy buffet. • The most stunning glass canisters in Australia. • Buffet attendants to refill the buffet and assist guests where required. • Custom company branded candy products! • Late notice supply – we thrive under pressure! Whatever the corporate event you have in mind we can cater for, from small conferences to large-scale corporate functions and events. But most importantly, we offer complete peace of mind, tying in seamlessly with your caterers to ensure you are free to enjoy your event with your guests. Not only do we liaise with you to ensure the creation of the perfect candy buffet, but we also ensure that your candy buffet achieves that ‘sense of occasion’ that you and your guests will long remember. Our dedicated Events Manager will be able to help you along the way to create your perfect corporate themed candy buffet for your guests. If you have a specific theme already picked out for your party, let us know and we can talk through ideas for the buffet, feel free to send through your mood boards and we will be able to work with your ideas. We have a large range of props and centrepieces to cater for different themes but not only this, our graphic designer can create almost anything for your custom artwork to ensure your theme is prominently displayed on your candy buffet. To assist those who are unsure and don’t have your theme picked out or you’re struggling to come up with ideas, here are some that we can offer you for you to think about. See our gallery of corporate event examples! For each event, and depending on your theme, we are able to create a candy buffet to suit. If your Gala dinner is a very elegant theme, perhaps with lots of stylish black and white, we will incorporate a delicious variety of chocolate to please all. From decadent white chocolate rocky road to melt in your mouth Maltballs, we can cater for white and milk chocolate lovers alike. To add some sparkle, we can elevate some of the jars with stunning bling risers, which will be the showstopper of the evening! The way that light sparkles and reflects off of our risers will be an eye catcher 100%! We can also include some chewy delicious white and black candy to suit this theme; everything from soft and flavourful jellybeans, rock candy fruit drops. We can’t forget about all time favourites such as milk bottle and Chico babies either! Both are reminiscent of days of old, and really the essence of what a candy buffet is all about! From the initial consultation where we discuss the styling and theme of your corporate event, until the very first moment you see the buffet set up, in all its glory, you will be blown away by the professionalism and dedication that you will receive from our switched on and very helpful staff. We will contact the venue to discuss all set up and pack down requirements, work with your Kosher cater and just generally be on top of every detail for you. You will see drafts of artwork, which wont be printed until you approve them; candy options, centerpiece options, and all delivered with a smile! Guests are always gasping and giggling and general blown away by our candy buffet tables and it serves as the perfect icebreaker for those events where guests may hail from a wide array of backgrounds. Further, for those guests that may tend to over-indulge in refreshments, the candy buffet keeps guests eating, extending their enjoyment of your marquee far beyond expectations. Finally, as guests retreat for the day, you can count on your brand swinging from their candy boxes as they head off into the evening, giving your brand even greater shelf-life after the event. To speak to one of our buffet stylists and receive a quotation for your work Christmas Party please contact us on 1300-924-427, or alternatively you can send us an enquiry here. Contact The Candy Buffet Company today for a free quote. Wow – what an impact. We had an elaborate, traditional Christmas theme with two separate guest groups; our Corporate Candy Buffet needed to cater for kids first, then for adults two hours later. The Candy Buffet Company was completely on my wavelength and did two gorgeous designs, turning the buffet from a fun, kid-friendly Christmas Candy shop to a sophisticated, decadent chocolate installation suitable for adults. Our guests loved it. I highly recommend the The Candy Buffet Company to enhance an elaborate theme, or indeed as a standalone feature to set the scene for any event. It is just gorgeous and it smells so good! Ten out of ten! Everything was wonderful, and the consultant you sent to do the setup was most helpful. Took us a bit to get everyone to dig in but once they got stuck in it went like clockwork. Thanks again for helping us pull this off, even with the last minute venue change. Everything at your end went smooth, from the short notice to book your service, to your arrival to set up and to the end to pack up. Thanks to all of you. I really appreciate the team work!